I'm back again to share with you more from Die-Namites Dies today. I had been thinking about trying a new technique and knew one of their intricate dies would be perfect. So here is how I did a double inlay technique using the Die-Namites Leafy Flourish die. 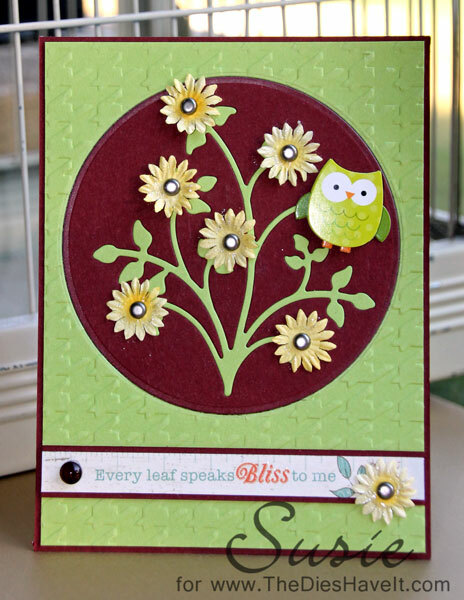 I used my die twice - once on the deep red circle shape and once on the green paper. I removed both die cuts from the papers. I took the positive green die cut and inserted it into the negative red die cut space. It laid perfectly in the negative space. I used tape on the back of my circle to hold everything in place. 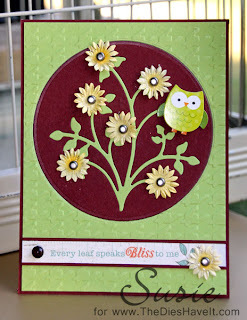 Then I cut a matching circle into my green embossed card front and did my inlay technique again. This time I laid the red circle right into the negative space of the green card front. I matted my card front and added my paper flowers and brads before attaching everything to a sturdy white card base. I hope you will try this technique. I already plan to use it again soon!! I'll be back tomorrow with a fun digital layout for you.